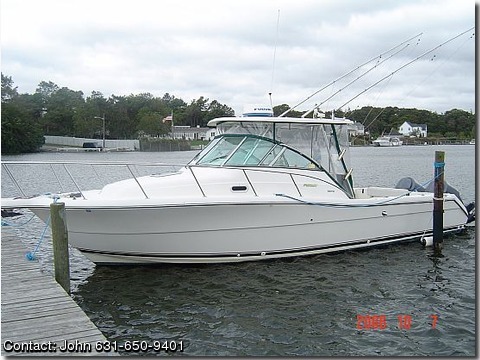 Boat surveyed April 2006 at $105,500! – Boat commissioned new in May of 2002. Other items: 5,000 BTU reverse cycle Heat/AC unit (just serviced with new control panel), Dual voltage fridge, full head with hot water shower, Furuno Navnet 10" Display Radar/Chartplotter Fishfinder, Simrad Auto-pilot; Integrated factory Rupp Outriggers & Center Rigger, eight hard-top mounted rod holders, four gunwale rodholders, windlass, power helm seat, port side companion seat, full canvas enclosure, overboard head discharge with holding tank; dockside water, 30 amp dockside power, huge storage/rod holder area under hydraulically lifted helm, six speaker AM/FM/CD Surius Satellite radio with amp, integrated fold-up transom seat, cockpit sink, tackle storage, bait prep area with freshwater wash, dive ladder, tons of extra storage inside and out! Economcial to run-Averaged 1.35 MPG over entire season with a 1.5+ MPG at 28 MPH cruise; 310 gallons of gas gives this boat more than canyon range! Great combo fish/cruise and family boat. Come see the fit, finish and attention to detail (not to the mention the UNBELIEVABLE customer service) that Pursuit is known for. 1 or 2 year engine warranty available through Yamah's Y.E.S. program. Must SELL by MID-MARCH!! – Moving up to another, larger Pursuit – Feel free to contact me with any questions you may have.